Nagaland hosts its 73rd Jangpetkong Sensor Mungdang (Jangpetkong Citizens Forum) Conference from January 31 to February 1 at Yimjenkimong village of Mokokchung. An official press release informed that minister of higher and technical education, Temjen Imna Along Longkumer and advisor of law and justice, border affairs, treasuries and accounts Dr Longrineken graced the conference as the special guests. The release further stated Imna at the inaugural on the opening night asserted that the Jangpetkong range has the potential to lead forward in every field. He called upon the gathering to rededicate themselves for the uplift of Naga society in general. He also urged upon them to shun the practices of blaming one another which would only bring about disunity among the communities. 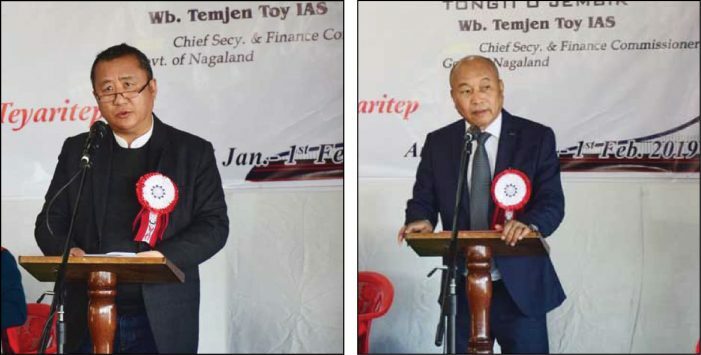 On the second day, chief secretary and finance commissioner, Temjen Toy speaking on the topic, ‘An authentic and upright society’ stressed on issues such as the ill effects of illegal mining and misuse of social media. The chief secretary further urged upon the gathering not to be contended with past glory but to emulate from the good example set by ‘our ancestors’. Later on the day, Dr Longrineken highlighted the various programmes and developments that has been implemented in the subdivision and also shared some of his visions of economic prosperity of the area.